I can take or leave the Champs-Elysées itself. True, it affords a wonderful view of the Arc de Triomphe. But its huge popularity with tourists means that it is frequently crowded. Given my dislike of humanity en masse, I therefore generally do my best to avoid it. Yet there are so many wonderful things close to the Champs-Elysées – art dealers, antique shops, clothes shops of the finest sort and the magnificent Musée Jacquemart-André – that I often want to be in its immediate area. The solution is to stay at an hotel in one of the streets off the main thoroughfare. So that is what I did. 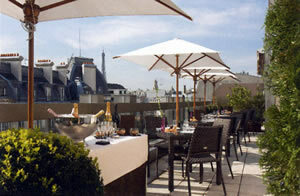 I went to the rue de Berri and checked into the Hôtel Warwick Champs-Elysées. Now it must be conceded immediately that the exterior of the Warwick – except you be a fan of architectural modernism – will not bring a smile to your face. But the street is quite narrow, so – unless you wish to indulge your masochistic tendencies by crossing to the opposite pavement and craning your neck – its aesthetic inadequacies will not alarm your sensitivities. Once inside, all is entirely pleasant. 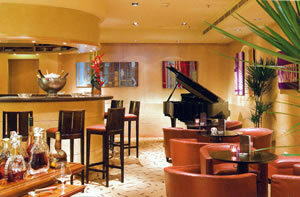 The lobby and adjoining bar area have recently been re-designed by Pierre Yves Rochon. They are comfortable and stylish. I particularly liked the large expanse of black marble underfoot. 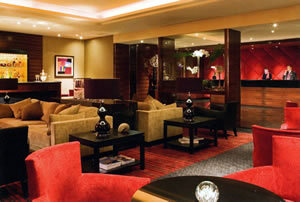 And at the Reception desk you will find friendly and efficient members of staff, eager to help you. The General Manager, Jean Sourbès, deserves praise for presiding over such a good team. There are 149 rooms, and I stayed in one of the standard rooms, called ‘Superior’. (Its size was modest, so you might wish to pay more for a Junior Suite.) Room 319 (610 euros a night, bed and breakfast for two) was on the third floor, and was at the back of the building. This ensured a complete absence of noise, which is always an important consideration with any accommodation near the Champs-Elysées. The room was a rectangle, with the bathroom and the separate loo taken from one corner and the adjacent space used to form the entrance area (with fitted wardrobes and a private safe). The bedroom area measured about 12 feet by 9 feet and had one easy chair and one desk chair. A wall of window overlooked a small garden. The controllable air conditioning was quiet and efficient. 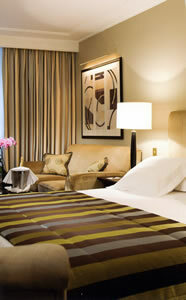 All the bedrooms have been designed by Patrick Tyberghein. He has used gentle tones of beige and grey to set off the dark brown of the wooden furniture (in this case, a writing-desk and a drinks cabinet). In the bathroom was more beige, in the form of marble tiles. These provided the setting for a tub of decent size (with a shower over it), one wash basin and a bidet. I lingered – as I am wont to do – over breakfast each morning. This was provided in the Restaurant Le W, the hotel’s dining room. This was a place of spotlights, potted palms, supportive armchairs and white tablecloths. It also turned out to be a place of canned birdsong, which startled me somewhat at first hearing. The kindly waiter turned down the volume of this unexpected twittering for me, and then brought to me pots of coffee and dishes of ice cubes. I secured from the buffet excellent bacon, mushrooms and grilled tomatoes, as well as slices of lovely lemon tart. These indications of Chef Dorian Wicart’s cuisine were promising, but I fear I was unable to sample his full carte. The restaurant is open for lunch and dinner from Monday to Friday, but I could only manage Sunday lunch. This meant that only a very short selection of simple dishes could be offered. Nevertheless, I had a very good lunch. I was served by Gregory, a charming and capable young fellow, who could not have been more attentive. The beef fillet was tender, full of flavour and accurately cooked, and came with tasty chips; and the proper, flat crème brûlée was creamy and delicious. (These two dishes were 44 euros.) Having also consumed some glasses of the house champagne (Deutz), half a bottle of Château Giscours and some made-in-house chocolate with almonds, I left the table a happy man. And I was happy to have stayed near the Champs-Elysées. Not on the Champs-Elysées, you understand, but near it – at the welcoming Hôtel Warwick.